As Manpower Consultancy, You have many task to perform. 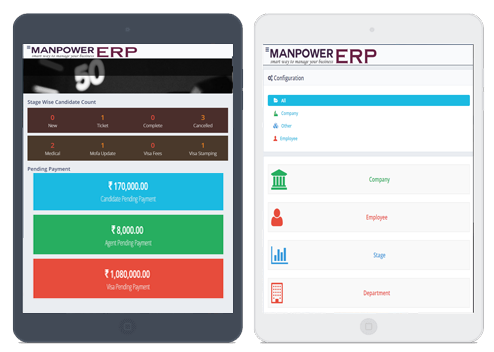 Manpower ERP provides all our business information in a click. 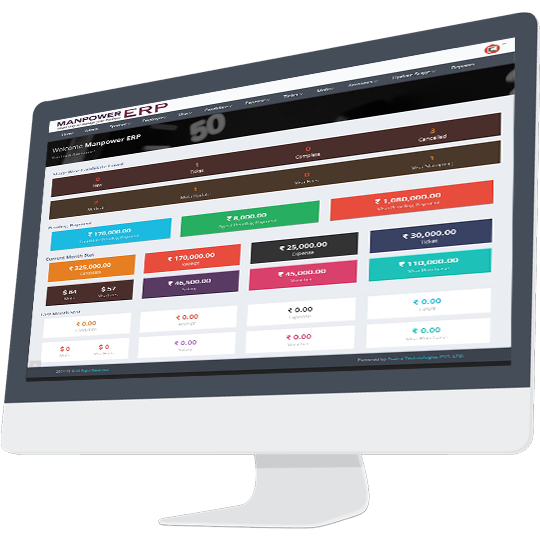 Run your business with Manpower ERP. Any time. Anywhere. ManpowerERP is a global leader in manpower consultancy software services. 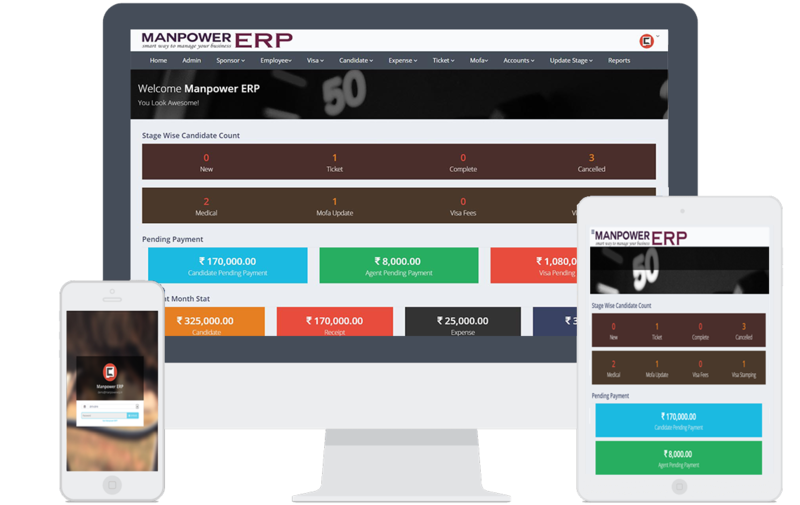 Today in the field of software development we have gained special recognition for developing this amazing manpower consultant software called ManpowerERP. This software has been specially designed for the Gulf manpower consultancy firms. While developing this software our software engineers have considered each and every aspects of the processes involved in manpower consultancy. Learn More..
Our manpower consultancy software or Manpower ERP helps in the post recruitment process. We offer sponsor management which includes managing all details of the sponsoring process. Our manpower software can be a great help in running the branches of the consultancy. There are a lot of people to handle, sponsors, agencies, travel agents, suppliers and many more. The Manpower ERP software provides effective Visa Management services to the clients. The visa management is actually an immigration and visa advisory service. Agents are important in oversees recruitment process. Agents help in getting the tickets for the selected candidates. Our software is an efficient agent management process. The main activity related to the recruitment process is to select the candidate and send them to the placed area. Hence it is important to properly manage the candidate details. Tickets need to be issued for the candidates after they are selected. There are agents who can issue tickets for a fee. With this software, you can easily manage the ticket agents. We successfully brought our data in one secure platform, thanks to ManpowerERP! Shehzad Khan, Sk Bureau Service. 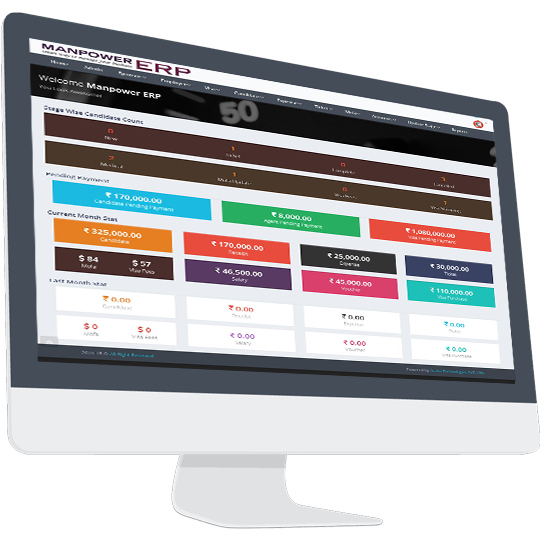 ManpowerERP has been designed to manage your post recruitment processes. Our clients will get facilities to create for the selected candidates. Through this software our clients will be able to track payment of travel agents. Our clients will also be able to use this software for tracking there receivable and payable accounts pertaining to their recruitment and placement activities. 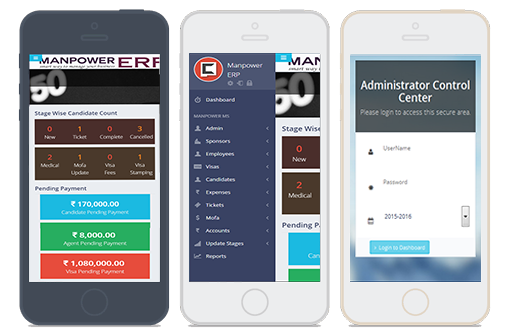 Learn More..
Start managing your manpower consultancy with ManpowerERP right away..
Our exclusive Manpower agency software will also help you to upload all your candidates records and store them securely. Besides, you will also get the facilities of maintaining your day to day accounts and other office expenses here. Learn More..